If you are not sure how to amp up your statement necklaces, you have come to the right place! There is an ample number of ways to show off your statement necklaces’ bright colours and designs. So, let’s see some cool ways to wear statement necklaces that can add a new dimension to your outfit! 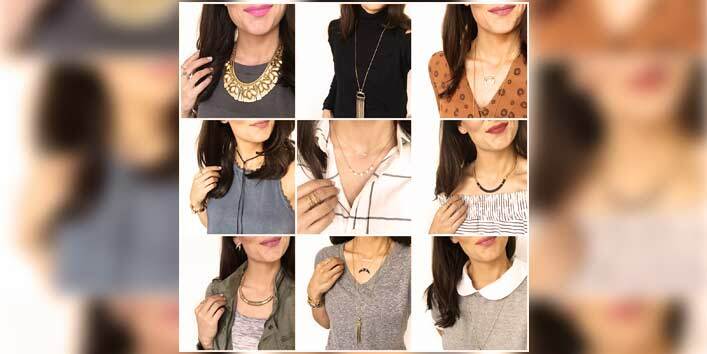 If you want to achieve a chic look, try out multi-layered necklaces on a casual and trendy outfit. It can be worn on collared striped shirts or even with V-necks. If you are a great fan of a black leather moto jacket, then this piece of the necklace will be the best pick, as you can match your jacket with it! This will give a bold look along with a classy touch. A colourful statement necklace can add a splash of colours to your outfit and can make your mood more cheerful. It not only brightens up your day but it also elicit warm smile from people around. With a pop of colour, this piece of statement necklace can be best paired up with girly outfits or single-coloured tops. You can also wear it on your favourite black dress, and can easily captivate other people’s mind! Want to jazz up your basic and boring outfits? Then sparkling statement necklace is the best option for you. This necklace will not only make other people gaze at you but will also give you a classy look. This can be paired up with your office attire as well as can be worn while heading out for some party. Like its name, it creates a sparkling image of yours in public! Who does not want pearl in their jewellery box! Pearl is an all-time favourite choice of almost every women. It creates a high-class sophisticated look and enhances your beauty. If you want to get a high-class look, just grab your trendy clothes and match it up with classic pearl statement necklace. Trust me, no one can keep their eyes off from you, even while you are standing in a crowd! We usually think of bold and dazzling evening necklaces, when we think of statement necklaces. But if you want to wear it for an everyday look, then this necklace is for you! The comfy statement necklaces can be worn on any day and any event. You can opt a statement necklace of faded shade without shiny rhinestones or crystals. This also depends on your taste and attire as well. So, think before you wear this piece of the necklace! For a feminine style, you can add a floral necklace piece in your jewellery box. It embellishes your outfit and gives you a swanky look. Your attire will look fabulous if you accessorize yourself with such statement necklaces. Guaranteed. 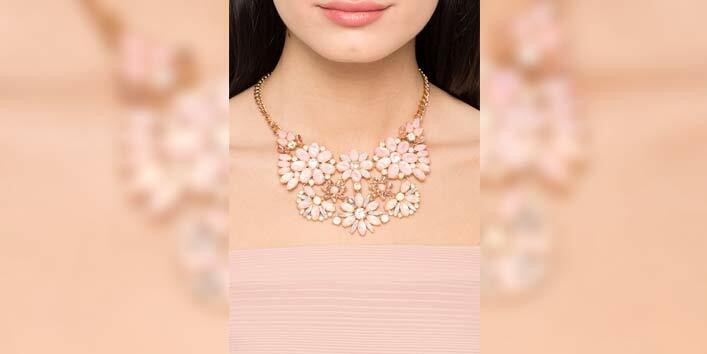 This floral piece of necklace can become the focal point of your style. Whether it’s daytime or night-time, for a soft look, team it up with your casual dress or top. Also Read: 6 Types of Dazzling Jewellery other than Gold! If you really want to change the appearance of your outfit, then try out and explore the world of unique statement necklaces! So, these were some of the cool ways to wear statement necklaces.